Not too long ago I read and reviewed Honor Among Thieves, the second book in this particular Star Wars series. That was such a rollicking good time that I knew I had to go back and read the first book in the series and that I’d be anxiously awaiting the third book. Razor’s Edge, by Martha Wells, is the first in the series and I’m glad I read James S.A. Corey’s book first or I might not have read any other Star Wars book if I’d begun with this. In this book, which is supposed to take place between Star Wars Episode IV: A New Hope and Star Wars Episode V: The Empire Strikes Back, Leia Organa and Han Solo head off to purchase some badly needed materials for the struggling Rebel Alliance. While en route, they are forced to try to evade a pirate ship which Leia recognizes as a former fleet ship from her (now destroyed) Alderaan. Although forced in to piracy in order to survive, Leia tries to convince the captain and her crew of the importance of the Rebel Alliance while the pirate coalition and the Empire are looking to take control of Organa, Solo, and the Alliance. My biggest ‘issue’ with the book was author Martha Wells’ handling of the established characters. Leia gets to step out of her maiden-in-distress role and show us the leader that we see later in the movies, and this is nicely done. Leia as an active leader is much more interesting than a damsel in distress. But none of the rest of the established characters get to stand out in any way. In fact, their dialog often sounds poor and it’s hard to hear the actors’ voices in what it written here. The attempt to be cute and C-3PO funny just doesn’t translate. Instead it just seems weak. While I haven’t read any books by Martha Wells prior to this, I am aware that she is a recognized and awarded author in the genre, but her work here seems weak and rushed. Metara walked up onto the dais. “I’m Captain Caline Metara and this is Leia Durane.” Durane was the false name they had agreed on earlier. I haven’t had one doubt that what I was doing was right. Right for me, right for my crew, the right thing to honor the memory of our dead. But … when I spoke to you, it was as if … I woke up from a dream. Since then, I haven’t been sure about anything. I made numerous notes on my Kindle about the amateurish writing, the three quotes above highlighting some of the dialog and description that really nagged on me while I was reading. I might expect writing like this in fan fiction, but not in a commissioned work by an established author. There was also very little build to the pacing. We seemed to always be on high alert and in mortal danger and so, when the true climactic sequence comes it doesn’t feel any different from the rest of the book. On the plus side (yes, there are some positives to this book) … the actions taken by Leia and her group seem perfectly fitted to the Star Wars saga and her mission makes a great deal of sense. Also, the new character of Captain Metara is quite nice. She, too, fits the Star Wars universe nicely. The only thing disappointing about this is that we don’t see Captain Metara in the films and she certainly seems enough of a large figure that we ought to come across her again. Over-all, this book highlights why I haven’t read more Star Wars universe tie-ins. We become quite attached to the figures as presented on the big screen and it can be easy to find fault in the way they are presented when done so in a different format. Martha Wells’ interpretation of Leia, Han, Luke, Chewbacca, and the droids was not how I would see them react and speak and so it didn’t ring true to me. Looking for a good book? 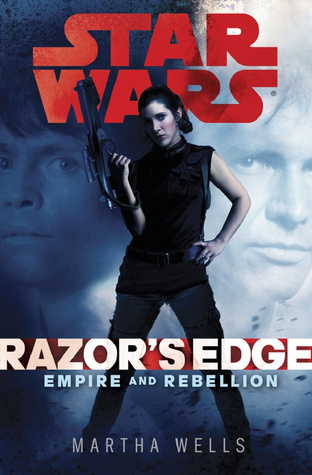 Razor’s Edge, the first book in a Star Wars series, Empire and Rebellion, is surely a must for true Star Wars devotees, but lacks the strong hand of plotting and characterization that might otherwise get the attention of other readers. ¹All quotes are from an Advance Reader’s Copy and may not reflect the final, printed version.